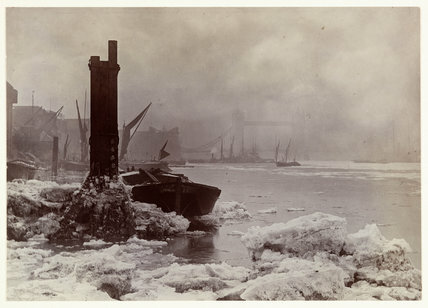 A photograph of an icy River Thames, taken by Colonel Joseph Gale (c 1835-1906) in the winter of 1894. In the foreground, a wooden post for measuring the river's height is visible. Large blocks of ice on the surface of the Thames indicate the river was certainly frozen at the margins. Tower Bridge is visible through the fog in the distance. The exceptionally cold winter of 1894-5 was described by gardeners at the time as having 'twelve weeks of frost'. By February 1895, the Thames was completely blocked by ice floes. Joseph Gale specialised in naturalistic photographs of rural life and figures in landscapes. He was one of the first members of the Linked Ring Brotherhood and was also a member of the Royal Photographic Society. Horses pulling a cart, c 1890. Fitting a horseshoe, c 1890. 'Ploughing and Burning', c 1890.